Catwoman told Bruce Wayne that “there’s a storm coming” and that seems to fit with this whole Robert Pattinson and Kristen Stewart debacle. I’m talking about the final promotional tour for the Twilight franchise. These two have to co-present at the 2012 VMAs, and go to various premieres in L.A., New York and London not to mention photo shoots and other random events. 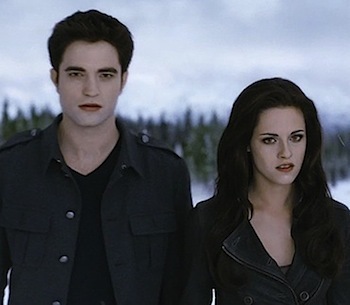 Breaking Dawn: Part 2 is in theaters November 16 but the appearances begin with the MTV Video Music Awards on September 6. This is certainly more suspenseful than the onscreen vampire adventures of Edward and Bella but I’m having a hard time making jokes about it. I’ve always been a supporter and fan of Kristen Stewart but defending her is harder than Fred Willard at a midnight showing of Shame and Basic Instinct. Ugh, I swear in that photo they both look like they were created by someone with only a basic idea of what humans look like in some horrible SIMS game.